Unfortunately I don't have mine up yet but never fear I WILL have decorations this year. My mom tried to talk me out of it because I'm moving so close to the holiday and the earliest I can get them up will be about 2 weeks before Christmas. There will be a LOT of unpacking but I'm a pro by now and the two extra bins of decorations won't be too much of a strain. I will share a new purchase with you. I usually only buy decorations on the after holiday sale but when I found this little guy at Pier One I didn't want to wait. I have a small foyer table that this little guy will look great on. 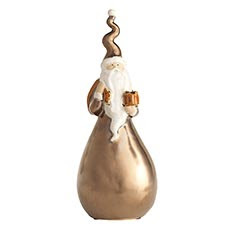 Before now I didn't have a Santa to display so I love his fancy gold suit that will match my other decorations. I'm hoping to hit up the after Christmas sale this year to find another set of bronze deer and some new gold sprigs for my tree.